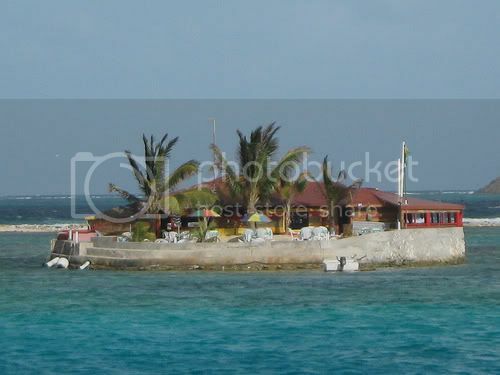 A favorite spot for locals and tourists in the Grenadines is a little island called "Happy Island". Just the name alone makes you want to check it out! Located near Union Island, this tiny spot has an interesting history. You see, this island was man-made by one of the locals named Janti. With so many cruisers and locals enjoying the flavor of conch, many conch shells were being discarded and causing an ugly sight. There were piles of empty conch shells scattered among the beaches. Janti decided that the beaches needed to be cleaned up, so he started picking up the conch shells. Janti needed a place to dispose of the shells, so he started placing them out at the end of a reef. Over the years, the pile continued to grow until Janti had enough shells to create his own island! So how does one create an island out of conch shells? Well, Janti used a mix of sand, concrete, patience and hard work! Once Janti had created the island, some palm trees were donated to finish it off. Today, not only does Janti live on the island, but he's added a bar and a restaurant as well. Talk about an entrepreneur! Janti now provides a great place to watch the sunset while enjoying a rum drink or some good food. Cheers to a guy that saw an opportunity and went for it! He's got to be one "happy" dude!